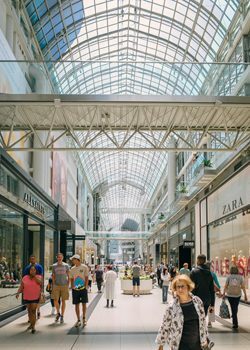 Covering several city blocks right in the heart of downtown Toronto, the Eaton Centre is one of Toronto’s busiest tourist attractions. It is the second biggest mall in Canada (after the West Edmonton Mall) and gets more annual visitors than the Las Vegas Strip. Built in 1977, the Toronto Eaton Centre is a remnant of the Canadian department store chain Eaton’s. At one time, Eaton’s was the largest department store retailer in Canada, but it went bankrupt in the 90s. Today, there are only two malls with the Eaton name still in Canada, one in Toronto and one in Montreal, with the Toronto Eaton Centre being the larger of the two. In the 1960s, Eaton’s owned the land where the Eaton Centre is currently located, but it was mostly used for warehouses and mail order buildings. Wanting to make better use of the location, Eaton’s decided to build a shopping complex there instead. The project was approved in 1972, and Eaton’s hired the German-Canadian architect Eberhard Zeidler to design the mall. Zeidler was born in Germany near the current Czech border in 1926. After the Second World War, he trained in the Bauhaus school of architecture in the German Democratic Republic before escaping to West Germany. There he designed factories and medical buildings until he immigrated to Canada in 1951. He joined the architecture firm Blackwell and Craig in Peterborough, Ontario, which was renamed Craig, Zeidler and Strong in 1963 when it moved to Toronto. The firm still exists and is now called Zeidler Partnership Architects. Zeidler’s training in the Bauhaus style made him aware of building technology, and his work is known for using technology as a central theme, such as in the McMaster University Health Sciences Centre, where steel trusses and ducts are exposed. Another major element of his work is the use of generous atriums. This can be seen in the interior of the Toronto Eaton Centre, which was designed as a multi-story galleria. 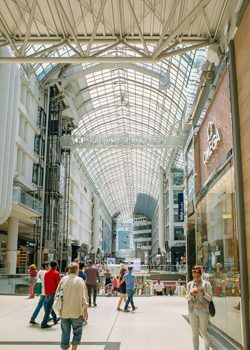 When the Eaton Centre opened, it was considered revolutionary in shopping centre architecture, influencing many other malls built at the time throughout North America. 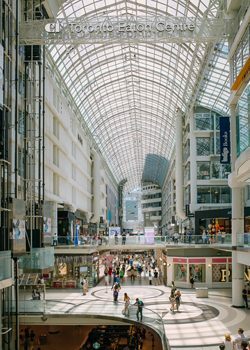 The Eaton Centre remains perhaps one of Zeidler’s most visited buildings, but his resume includes: Ontario Place, the Queen’s Quay Terminal, Princess Margaret Hospital, and the Hospital for Sick Children (SickKids) in Toronto; Canada Place for Expo 86 in Vancouver; and the MediaPark in Cologne, Germany. Zeidler is one of Canada’s most successful architects, having won three Governor General’s Medals for Architecture, the Gold Medal of the Royal Architectural Institute of Canada, and having been made an officer of the Order of Canada.